I have been knitting for Britain over the last few weeks and there are few things I can't show you, because they are Christmas knits. However, I have one thing to show off that I am pretty sure I'm safe to share, because my friend doesn't read my blog and that is a cute ruffly shawlette. 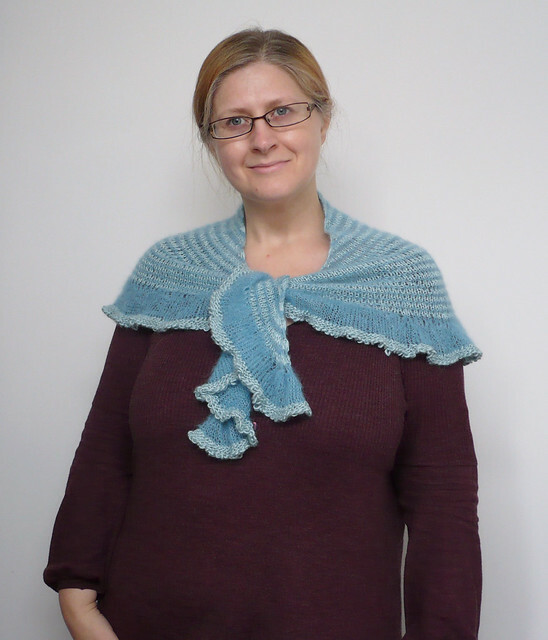 Remember the other week when I revealed a new pattern from my friend, well she released another shawl pattern at around the same time. It's another freebie too! This pattern is called Cadbury Ruffle Shawl by More Twist. The pattern calls for 50g of Colinette Tao (DK) and 25g of Colinette Parisienne (lace weight). I really wanted to start this project quickly, as, you might have noticed, Christmas is fast approaching. 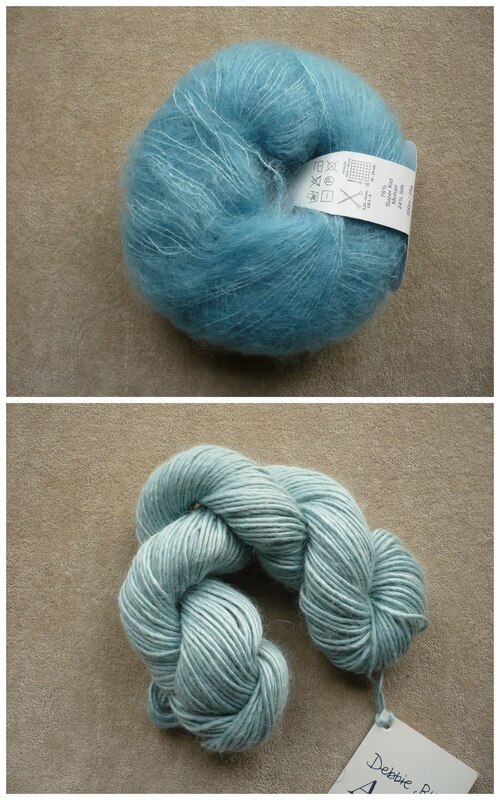 I decided to change the yarn choices to 100g of Debbie Bliss Andes (DK) and 25g Debbie Bliss Angel (lace weight). As, with the recommended yarn, the yarn I chose was from the same manufacturer the colours were pretty similar and blended nicely. My version is slightly different from the pattern version as I ran out of Angel as I was casting off. I decided to undo the cast off edge and then knit 5 rows of garter stitch in Andes. I then cast off as directed in the pattern. 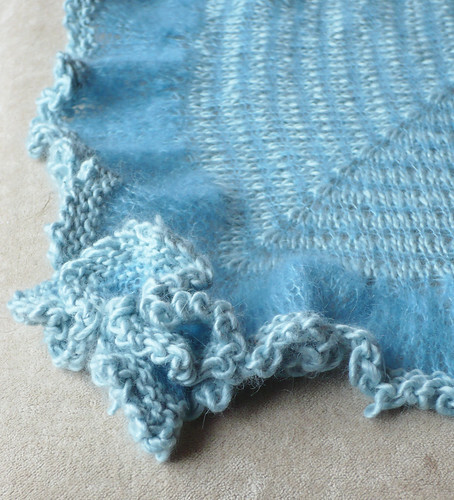 This extra section of the heavier yarn has given the shawl an even more ruffled edge. The added weight of the Andes, also makes the shawl drape better (in my opinion). This shawlette is so pretty and extremely warm, that I think it would be a perfect Christmas party accessory. It was a fun and quick knit, and I think it would be perfect for using up an odd ball of Kidsilk Haze that you might have knocking about. I think any silk based DK yarn would work well as the contrast yarn. 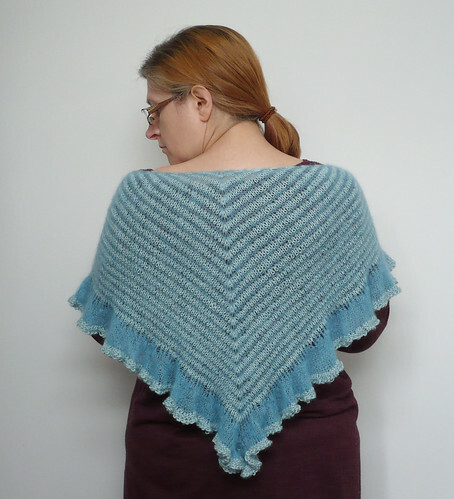 In fact I have some Louisa Harding Grace that would work well with a pale blue Kidsilk Haze I've got, so maybe I'll get to make a version of this shawl for myself! Please have a look at some of the other projects that my blogging colleagues have shared today, by clicking on the buttons below, and hopefully in a week or so I can share some of my other Christmas projects.